2018/2019 EKITI STATE UNIVERSITY (EKSU) DEGREE UNDERGRADUATE ADMISSION EXERCISE. The is to inform the general public, parents, sponsors and admission seekers through UTME and direct Entry to Ekiti State University that the screening exercise for the University has begun. All concerned should take note of all detailed as published by the management. Special attention should be paid to the the requirements, price, cut off mark and application processes. The Post UTME cut off mark is 180 and above in UTME subjects relevant for applicants proposed courses. Candidates must have chosen EKSU as first or second choice during UTME registration or has earlier changed to them as either of the choices. Candidates who did not choose the university earlier but scored 180 or above can also obtain the form. Note that that if given admission, the university may eventually instruct you to change them as first choice. Direct Entry (DE) applicants mush be holder of Bsc, HN, NCE, ND, IJMB, JUPEB or their equivalence. 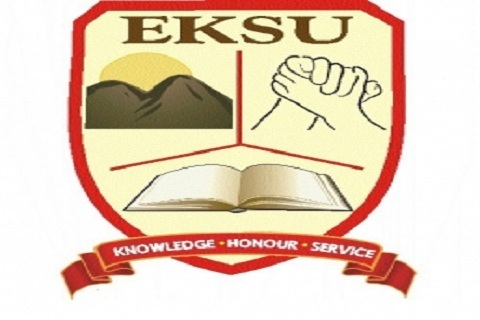 EKSU will admit candidates for MEDICINE this session. Online Registration starts July 18 and closes October 5 (updated for 2nd Round Admission). Click "New Applicant" and provide required details to create your account on the portal. Make your JAMB registration number your password. After this, a link will be sent to your email. Click on the link sent to your email and you will be redirected to the admission portal where you will log in again with JAMB registration number and password created earlier. You will directed to make online payment of . You will need details of your SSCE results to complete the registration. if you're awaiting a result, you to upload latest two weeks after release. Preview you details and ensure all is correct, confirm before submitting finally. Print your acknowledgement slip. You will see screen date on this and bring it along for the screening. Note also that, the screening is a schedule CBT. Exams date will be on your acknowledgement slip.